Finished Suits and hungry for more from the beautiful Meghan Markel? Watch these 17 witty legal TV shows like SUITS (available on Netflix too) with wide eyes. Plus, find out everything you want to know about the cast of Suits and a quick episode guide to the shows most popular seasons! Find out which shows are our favorites and tell us yours! Suits is a legal drama television series that takes place at one of Manhattan’s top corporate law firms. The firm is called Pearson Specter Litt, named after its 3 partners- Jessica Pearson, Harvey Specter and Louis Litt. After graduating from Harvard Law School, Harvey worked as an Assistant District Attorney before working at the law firm, first as a Senior Associate, then as a Junior Partner and eventually Name and Managing Partner. After he was promoted to Junior Partner, he had to hire an Associate Attorney to work with him. While Mike aspired to be a lawyer, he never actually went to law school. However, he was hired at the law firm because he had skills that impressed Harvey, like having both a photographic memory and encyclopedia law knowledge. The main focus of Suits is Harvey and Mike trying corporate cases for the law firm, while also trying to keep Mike’s secret from getting out. Eventually, Donna, Rachel, Jessica and Louis all discover his secret. When season 8 returns, sometime in 2019, it will feature 3 of the main original cast members and will also showcase 2 recurring cast members promoted to series regular and 1 fresh new face in the cast. Noticeably absent from season 8 will be 3 of the original cast members. Am I confusing anyone here? Okay, so let’s break this all down. Harvey is the Name Partner and Managing Partner at Pearson Specter Litt Law Firm. He graduated from Harvard Law School 5th in his class. Harvey is a member of the Gotham Car Club of New York. Louis is the Name Partner at Pearson Specter Litt Law Firm. He is known to be a corporate finance expert. Louis once embezzled money for shady businessman- Charles Forstman- and then blackmailed Jessica into making him a partner in the firm after finding out that Mike never actually attended law school. Donna is the Chief Operating Officer at Pearson Specter Litt Law Firm. She previously worked as a legal secretary for Harvey. Donna is known to be extremely knowledgeable, menacing and perceptive. Alex was a recurring character starting in season 7 and is now a series regular. He is a Senior Partner at Pearson Specter Litt Law Firm. Alex is one of Harvey’s most trusted friends. Katrina was a recurring character starting in season 2 and is now a series regular. She is a Junior Partner at Pearson Specter Litt Law Firm. Katrina formerly worked as an Assistant District Attorney. Not much is currently known about Heigl’s character other than Samantha Wheeler is the law firm’s newest partner, hot off the heels of the departures of Mike and Rachel. We also know that Wheeler is said to be fierce, mysterious, smart and talented. Mike is a former Associate Attorney at Pearson Specter Litt Law Firm. Adams left at the end of season 7 so that he could devote more time to his wife- actress Troian Bellisario (Spencer of Pretty Little Liars). Rachel is a former Senior Paralegal at Pearson Specter Litt Law Firm. As for why Markle left the show? Well, I am sure you know that she now goes by the name- Meghan, Duchess of Sussex. On May 19, 2018, Markle married Prince Harry, Duke of Essex. Jessica is a former Managing Partner at Pearson Specter Litt Law Firm. Gina Torres left after the season 6 mid season finale, because it was tough traveling back and forth from her home in Los Angeles, California to Toronto, Canada, where Suits is filmed. Now that we are all caught up on the cast of Suits, let’s check out some of their most popular seasons so far! The first season of Suits aired between June 23, 2011 and September 8, 2011 on the USA Network and introduced six key characters to the audience (see Cast of Suits above). Season 1 also had a few notable guest stars, including Tom Lipinski, Vanessa Ray, and Rebecca Schull. Read on for a quick Suits episode guide for season 1. Episode 1- Pilot Harvey hires a brilliant college dropout to be his Associate Attorney, as they try to keep Mike’s secret (he never attended law school) from the rest of the law firm. Episode 2- Errors & Omissions Louis blackmails Mike so he can score a prestigious client. Episode 3- Inside Track Harvey and Mike try to oust the CEO of a motor company. Episode 4- Dirty Little Secrets Harvey defends Jessica’s ex-husband in an ALS medication case. Episode 5- Bail Out Harvey must decide between closing a lucrative deal or defend his cab driver, Harry, in a lawsuit. Episode 6- Tricks of the Trade Harvey and Mike defend a client who is wrongly accused of insider trading. Episode 7- Play the Man Mike takes part in a mock trial with one of Louis’ proteges- Kyle Durant. Episode 8- Identity Crisis ola Jensen- the daughter of businessman, Jerome Jensen- threatens to expose Mike’s secret unless the law firm drops the case they have against her. Episode 9- Undefeated Harvey goes up against Travis Tanner- an undefeated lawyer from Boston- on a class-action lawsuit. Episode 10- Shelf Life Mike and Harvey are tasked with firing Stan Jacobson- who has been employed with a fake diploma for 9 years. Episode 11- Rules of the Game Cameron Dennis- Harvey’s former mentor- asks for Harvey’s help when his office is investigated for hiding evidence. Episode 12- Dog Fight Harvey attempts to free an innocent man but hits a snag with the new District Attorney- Terrence Wolf. Suits Season 6 premiered on July 23, 2016 and ended on March 1, 2017. Gina Torres continued her role as Jessica Pearson throughout the first half of the season. She left in the summer finale, but returned one more time in the spring finale. Read on for our Suits episode guide for season 6. Episode 1- To Trouble Mike begins his prison sentence for fraud, while the few remaining employees try to save Pearson Specter Litt. Episode 2- Accounts Payable Pearson Specter Litt faces a million-dollar lawsuit from former clients. Episode 3- Back on the Map Louis gets an office tenant to help pay the bills. Episode 4- Turn Sean Cahill- a Prosecutor with the U.S. Attorney’s Office- offers Mike a deal. Episode 5- Trust Mike tries to gain the trust of his cellmate- Kevin Miller. Episode 6- Spain Sean Cahill prosecutes William Sutter for insider trading, with Harvey as his defense lawyer. Episode 7- Shake the Trees Donna, Harvey and Louis discover a link to Sutter’s insider trades. Episode 8- Borrowed Time Jessica and Rachel try to delay the execution of Leonard Bailey- a death row inmate. Episode 9- The Hand That Feeds You Harvey considers letting Frank Gallo- a prison inmate who was prosecuted by Harvey- free in order to protect Mike. Episode 10- P.S.L Jessica and Rachel successfully exonerate Leonard Bailey. Episode 11- She’s Gone Jessica leaves the law firm after she believes Harvey and Louis neglect to put the needs of the law firm first. Episode 12- The Painting Harvey makes amends with his mother- Lily Specter. Episode 13- Teeth, Nose, Teeth Rachel is rejected by the bar on ethical grounds. Episode 14- Admission of Guilt Harvey helps Mike on his case with the ethics board, after he is denied from practicing as a lawyer. Episode 15- Quid Pro Quo Mike’s class-action lawsuit hits a brick wall when Specter Litt pulls out of the lawsuit. Episode 16- Character & Fitness Mike Looks to Harvey and Rachel for help when an obstacle may prevent him from becoming a lawyer. Season 7 aired from July 12, 2017 through April 25, 2018. Meghan Markle left the show in the season finale and married her Prince Charming shortly after. You would think that her departure would be among the highest-rated episodes of the season, but it actually ranked at the 4th lowest, with just 1.07 million viewers. Check out our Suits Season 7 episode guide. Episode 1- Skin in the Game Harvey is in charge at Specter Litt, Mike returns to work for the firm and Donna is promoted to Senior Partner. Episode 2- The Statue Harvey makes a bold move at the law firm, much to the dismay of Louis and Donna. Episode 3- Mudmare When Mike takes on a pro bono case of a prisoner’s wrongful death, he hits a snag when he finds out there is a conflict of interest. Episode 4- Divide & Conquer The law firm- Bratton Gould- tries to steal clients from Specter Litt. Episode 5- Brooklyn Housing Mike continues on his pro bono prison case under the cover of a case against the Brooklyn Housing Projects. Episode 6- Home to Roost Stephanie Patel- a former 4th-year associate at the law firm- files a sexual harassment lawsuit against Louis. Episode 7- Full Disclosure Harvey discovers just how involved Senior Partner- Alex Williams- is in Mike’s pro bono prison case. Episode 8- 100 Harvey and Mike seek help from Robert Zane- Rachel’s father and lawyer at Rand, Kaldore & Zane- to take over Mike’s pro bono prison case. Episode 9- Shame Harvey takes on Andy Malick- a Prosecutor that previously worked with Harvey. Episode 10- Donna Donna finds herself drawn into the Harvey vs. Malick case. Episode 11- Hard Truths Harvey and Louis work together to try and protect the future of Specter Litt. Episode 12- Bad Man Mike is thrown a curveball by Oliver Grady- an attorney at the Eastside Legal Clinic. Episode 13- Inevitable Harvey ends his relationship with Paula Agard- his former therapist. Episode 14- Pulling the Goalie Harvey and Mike defend Judge Ralls- the judge in Mike’s fraud case- but eventually this puts them at odds. Episode 15- Tiny Violin Louis and Mike are forced to deal with a lawsuit headed up by Stanley Gordon. Episode 16- Good-Bye Mike and Rachel get married and prepare their move to Seattle- where they will both head up legal firms. So, Suits is a legal drama television series, right? And that means if you want to watch TV shows like Suits, you need to find other legal dramas, right? While it is not a bad idea to have some type of legal or courtroom drama in the show, it really isn’t a total necessity. Did you know that shows like Mad Men (period drama), House of Cards (political drama) and Chuck (action, comedy, drama), all have things in common with Suits? 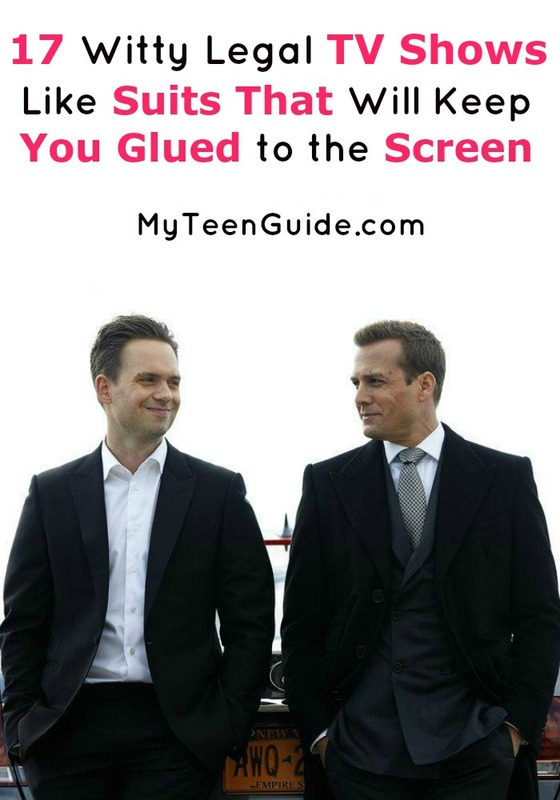 If you enjoy watching Harvey (Gabriel Macht), Mike (Patrick J. Adams) and other remarkable characters in action, you might also want to check out some other witty TV shows like Suits. Ally McBeal is smart, funny and totally goofy, just like the rest of their colleagues in this classic TV show that probably set the path for others. Ally McBeal shares that quirky humor you can also see in Suits, but on a much larger scale. How to Get Away with Murder follows a group of aspiring law students and their genius professor of criminal defense (Viola Davis) as they all get involved in a crazy murder plot. This TV show has everything – great plot and story, amazing acting and a lot of emotions. However, it does lack a bit of humor, although it is not completely devoid of it. It’s definitely not among the wittiest TV shows like Suits, but it’ll definitely keep you watching! One of the pioneers in the legal genre, this TV show doesn’t just showcase a crime from the legal standpoint, it also follows the police investigation that gets the cases to the court. Law and Order lasted for 20 seasons, so you better be ready to get into it for the long haul. If you’re looking for TV shows like Suits that you can binge on for a very long time, this is definitely the one! This TV show has a lot of humor, and a romantic involvement between colleagues, which made me think of it in terms of being similar to Suits, especially since it is also a legal TV show. The show is about a woman who quit her job as an attorney at her father’s law firm in order to become a mediator and her way of dealing with the death of her father. There aren’t many TV shows about financial crimes out there, and White Collar is one of the selected few that manage to make the world of hedge funds and stock markets into a great entertainment. We take a look at a white-collar criminal who gets released from prison in order to help the FBI with their financial crime cases. With stunning Glenn Close in the leading role, Damages comes as close to a serious drama as any TV show can. It lacks the humor almost completely, but if you like legal shows then you will love this one regardless of that fact. This FX hit show follows a young, naïve law student who becomes a protégé of a brilliant but unscrupulous litigator. If you liked Breaking Bad (of course you liked it!) then you need to start watching this amazing spin-off about the unforgettable low-life, morally adaptable lawyer Saul Goodman (Bob Odenkirk). Even though there isn’t much of a courtside action, the legal side of this show is just one small part of it. The witty humor, smart dialogues and moral ambiguity which are often present in Suits, also take the front seat in Better Call Saul. Created by David E. Kelly, the father of goofy, funny and intelligent characters in legal TV shows – Ally McBeal, and the next two entries on my list are also his work – Harry’s Law, unfortunately, lasted just two seasons. That is a real shame if you ask me, especially when you consider that the titular role of an unconventional lawyer Harriet Korn was played by wonderful Kathy Bates. The Practice is one of the first extremely popular legal TV shows and many that came after owe a lot to it. Rich with many colorful characters, The Practice went on for eight remarkable seasons, but the best thing about this show comes from the fact that we got a great spin-off TV series out of it, which is the next show on my list. With William Shatner (Danny Crane!) and James Spader as bellowed character from The Practice in the leading roles, Boston Legal is my favorite legal TV show and arguably one of the best of all times. Weird, unconventional humor and strong and independent characters lead us through the everyday lives of employees in one of the best lawl firms in Boston. Plenty of courtside action, great dialogues, and Danny Crane! of course, make this show a must-watch for all Suits fans out there. While Suits features the unconventional combination of Harvey Specter and Mike Ross, the crime drama, Castle, features the unconventional combination of Richard Castle and Kate Beckett. Castle was one of my absolute favorite shows and I was devastated when it was cancelled after 8 seasons. Suits and Chuck both combine comedy and drama, but they also share another similarity- pop culture references! Mike Ross- “This isn’t Havana in the 1950s, why do we have to wear tuxes? What are you, Moe Greene?” (Moe Greene is a character from the 1972 movie- The Godfather). Chuck Bartowski- “Are we-are you talking about Señor Wookiee over there?” (Wookiee is a reference to the intelligent bipeds from the Star Wars movies). Yes, Suits is a legal drama and House is a medical drama but stay with me here for a moment because you’re going to be shocked that the 2 main characters have a couple things in common. Both shows feature a lead character that is a bit of a smarty pants. Suits’ resident smart guy is none other than Harvey Specter, while House features the rather complicated Gregory House. Not only are they both wise guys, but they are also both incredibly smart and hard to deal with. Okay, you’re probably thinking that House of Cards deals with politics and Suits deals with law, right? Well, you’re right, but the 2 shows do have one thing in common! On Suits, Mike Ross will do whatever it takes to rise to the top and the same can be said for Frank Underwood on House of Cards. See how 2 shows that are different can also be similar in some ways? Like Suits, Mad Men is set in a business environment- Suits takes place at a law firm and Mad Men takes place at an advertising firm. Also, in my personal opinion, there are a couple of similarities between Donna Paulsen from Suits and Joan Harris from Mad Men. Does anyone else think so too? One thing is that they are both redheads and another is that they both have dominating personalities. Besides the fact that both Suits and Psych are entertaining and funny, can you guess what else the 2 shows have in common? If you guessed that they both feature a character that has lied about their careers, you’re absolutely right! On Suits, Mike Ross pretends to be a lawyer, while on Psych, Shawn Spencer pretends to be a psychic. Okay, so who is tired of my strange comparisons of Suits with these other TV shows? No one? Good! So, what does Suits have in common with The West Wing? One word- Donna! That would be Donna Paulsen (Suits) and Donna Moss (The West Wing). First, they’re both assistants to one of their show’s main characters. Donna Paulsen is Harvey Specter’s legal secretary, while Donna Moss is Josh Lyman’s senior assistant. Also, both Donnas have a rather sarcastic personality. I hope that my list will help you find a legal TV show that will be able to at least come close to Suits in your eyes and that you will get to enjoy the world of lawyers, judges and criminals represented in these TV shows. What are some of your favorite TV shows like Suits? Share below!